In 2005, Hurricane Katrina put 80% of New Orleans underwater and demolished nearly all waterfront structures. But this film is not about Katrina, it is about the larger region south of New Orleans that survived the hurricane and is now facing its latest threat—hordes of monstrous 20 pound rodents known as “nutria”. Louisiana’s coastal wetlands are one of the largest disappearing landmasses in the world and the voracious appetite of this curious and unexpected invasive species from South America is greatly accelerating coastal erosion, which in turn makes the area even more vulnerable to hurricanes. As the coastline disappears, the hunters and trappers, fishermen and shrimpers, storytellers and musicians are leaving en masse. Nonetheless, a stalwart few remain and are fighting back. 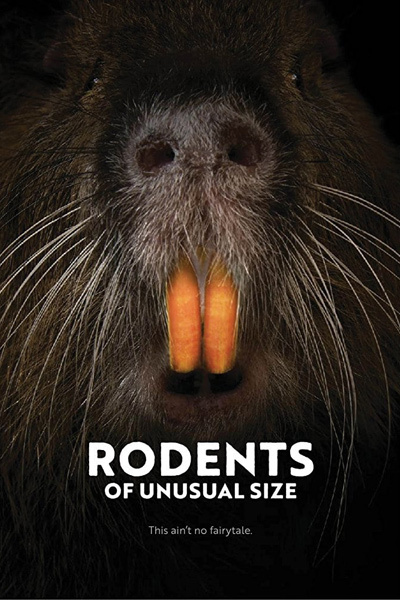 RODENTS OF UNUSUAL SIZE tells the story of one such diehard, Thomas Gonzales, and his community of Delacroix Island, as they fight the invasion of the rodents. The State of Louisiana has started a program that pays a $5 bounty for every nutria tail collected, which has helped the effort by encouraging former trappers to hunt the nutrias for their tails instead of the fur. Others have tried business ventures to harvest the nutria for their fur and meat in hopes that by creating a demand for this sustainable resource they can help protect the wetlands and fight back the rodents. And yet despite the havoc this invasive species has done to Southern Louisiana, it has also been embraced by the culture. The Audubon Zoo in New Orleans has opened a nutria exhibit, the local Triple-A baseball team has a nutria as a mascot, and even some Cajuns have nutria as pets. Through these offbeat and unexpected stories of the people confronting the nutria problem, RODENTS OF UNUSUAL SIZE examines issues surrounding coastal erosion, the devastation surrounding hurricanes, loss of culture and homeland, and the resilience of the human spirit.